For some reason folks tend to think that Victorians style of dress, furnishings and today's topic, plates, were more black and white. However, for those of you who actually collect antiques, you know that not to be true. 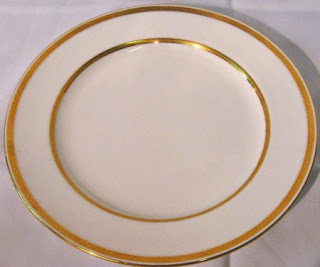 Today I thought I'd highlight some dinnerware from the 19th Century. I have a post from my blog with patterns for dishes that I'll share as well at the end of this post. The images you'll be seeing come from the internet may of which come from auctions or online sales, I will post the image, credit the site and give the link. If the links change, I apologize but I don't know how long some of these places keep their old stock up for customers to view. The next is a simple Tiffany Gold Band Plate. There is no link for this image because it is simply a link to the image. 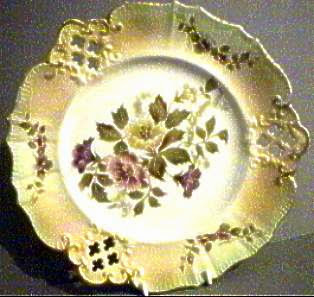 The next is a lovely early Carlton Ware reticulated dessert plate in "Morning Glory" pattern on a blush ground with gilt edging. 9 1/4" diameter, bearing the "Crown" backstamp, date circa 1895. Here's another Carlton Ware and what the Zeichen Antiques sale page says: Another of Carlton Ware's beautiful early pierced dishes, but this time oval in shape in the Carnation pattern. 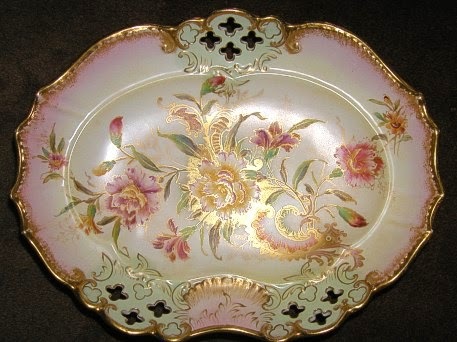 The flowers and foliage outlined in gilt and the ground has a slight pink blush to the outside edge. 10.5" x 8" x 2.5" high. Blue Crown backstamp with registration no 30945, making this dish circa 1899. Slight rubbing to the gilt edge & There is a minute firing mark on one pierce hole edge which does not go through to the other side & is mentioned for accuracy. Link is provided with the image above. The link to this board is Tableware- Delightful Dishware on Pinterest. These are just a few examples that our 19th Century ancestors or characters might have had on their tables. In my newest book THE INNKEEPER'S WIFE the heroine has various sets of dishes she uses for the customers of the inn and for the private family times. Speaking of THE INNKEEPER'S WIFE I'm offering a free copy in a drawing that will be held on the first of Nov. Post a comment to enter to win your free copy. Please put in your email address so I can notify you privately and we can exchange shipping information. 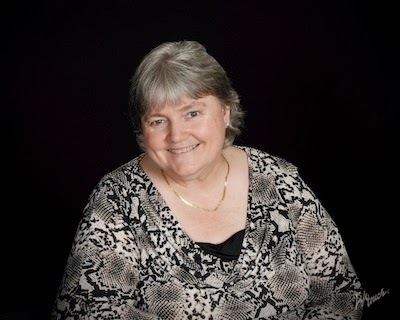 Lynn A. Coleman is an award winning & best-selling author who makes her home in Keystone Heights, Florida, with her husband of 40 years. Lynn's newest novel THE INNKEEPER'S WIFE will be released November 1, 2014. It is the second in her Historical St. Augustine, FL. series. If you are interested in 19th Century Carriages & Wagons follow the enclosed link. They certainly did. I've also discovered the men had color too. I haven't found many images that show the color but in the details about the outfits it mentions the various colors. I love antiques and even have a booth at an antique mall. 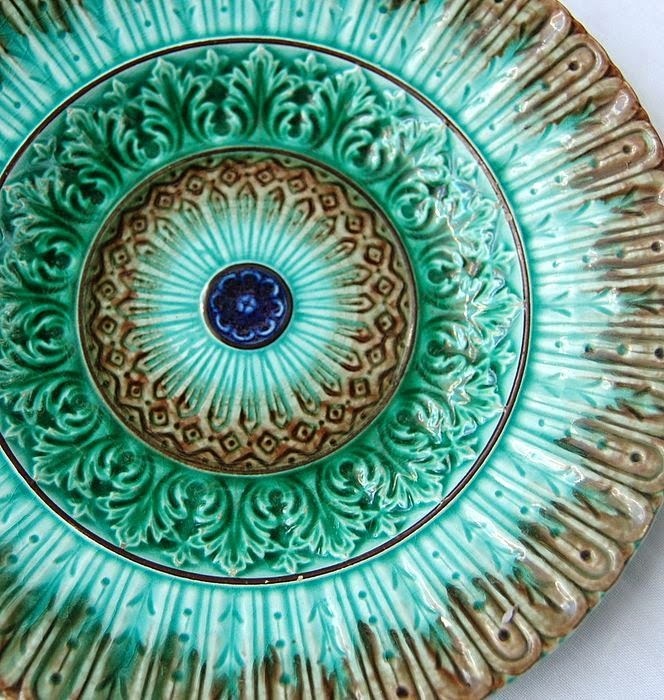 I love the colors in the Majolica plate. They are sweet, Vickie, I love them too. The plates are so beautiful. I would love to watch the process. Just amazing. My mom has a few pieces from her mother who came to America from Sweden in 1910 or so(I know wrong time period but beautiful too!). So precious. I would love to win the Innkeeper's Wife. chris_davebures@bellsouth.net I just love these daily posts on history. I am learning so very much thank you to all of you who work so hard and share your knowledge and findings. If the plates came from your grandmother and your mom came in 1910 it is possible some might be from the 19th century. Consider yourself entered into the drawing for the book, Chris. Love the plates, Lynn. I found some of these when I was doing research on Presidential China for one of my posts. The designs and colors of the 19th century are really beautiful. Thanks for displaying them here. I do have one antique dessert plate I found in an antique shop that is a pattern of roses and a gold trimmed edge similar to the Limoges at the top. That's great, Martha. I don't believe I have any antique plates in the house. There was a period when my kids broke just about everything, oh wait, hubby did too, something about tossing a football in the house. Beautiful! I love china. I'd be thrilled to have an antique set! 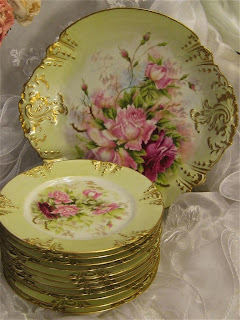 I have collected many beautiful plates and other dinnerware pieces from the 19th century and early 20th century. there are so many beautiful pieces. My collection began in the 1950's, when a great aunt died and I was allowed to chose a few pieces from her collection. I am trying to downsize at the present time, and sent many lovely pieces to the auction last December. I do still enjoy looking at pictures and reading the historic information. Thanks for sharing. It's so hard to choose when downsizing, I'm still working on that. In fact, I'm in the process of collecting a hundred plates of an old corelle pattern so I can donate the dishes to the church. I have over forty at the time of my last count. Consider yourself entered into the contest, Kay. What a neat idea, Lynn! What pattern are you collecting for the church? 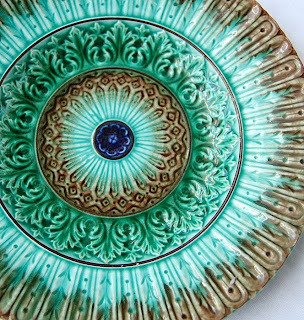 These plates are stunning, so much detail. I really like the ones that have the scalloped edges. Thanks, Rebecca, consider yourself entered into the drawing for my newest novel The Innkeeper's Wife. What gorgeous dishes! Thank you for sharing this lovely post and pics, Lynn, as well as the giveaway opportunity! You're welcome, Britney and you are now entered in the give away. How exciting Janet. I used to have a collection of old tea cups but I sold them to help fund a missions trip for Hubby to go to Haiti. BTW consider yourself entered into the free book contest. Wow! Those are so beautiful! I think they're far more beautiful than what we have today. We certainly don't have artists painting them individually in the factories today. Hi Sharon, you are entered in the drawing. I forgot to put in the post that I'll be doing the drawing for the free book on the 1st of November, the date of it's release. So, stay tune and you can still enter. Chris B is the winner, thanks to all of you who have entered.